An alternative to #1 as a starting point for a house tour of Berkeley Square might be #6, the first residence built in the new subdivision. 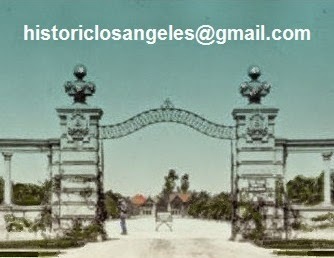 William R. Burke, a Arkansan by birth, was a Democrat, a Catholic, a polo player, and a member of the California Club as well as of the Midwick and Los Angeles country clubs (the latter of which, at the beginning of the development of the Square, was still about 10 blocks to its north). He was married to a New Orleanian, the couple's Southern roots no doubt accounting for their choice of a plantationesque design for their house on lots 26 and 27—addressed #26 until it became #6 with changes made on the street at the time of the city's annexation-related renumberings circa 1912. The Burkes' choice of a lot on the south side of the Square is a bit surprising in that the 24th Street School was just beyond the intervening private alley, but perhaps their deep backyard made any worries of playground noise moot. At any rate, the Los Angeles Times of November 12, 1905, reported that architects Sumner Hunt and Wesley Eager had completed plans for "a two-story Colonial-style dwelling for W.R. Burke." 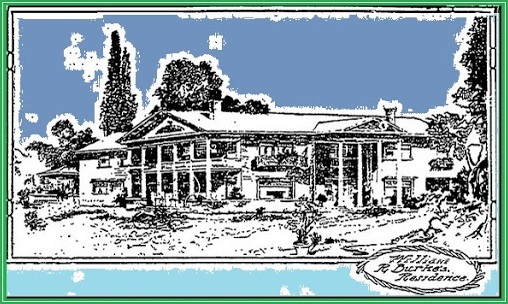 Hunt & Eager were cited as architects of a large private stable and carriage house for Burke on the property by the Los Angeles Herald on February 25, 1906. Before going any further, we must discuss Los Angeles architects by the name of Hunt. Sumner Hunt was in partnership with Wesley Eager at the time of the Burke house having been designed; he is often confused, even in modern online databases, with the unrelated Myron Hunt, each often being credited mistakenly with the other's work. 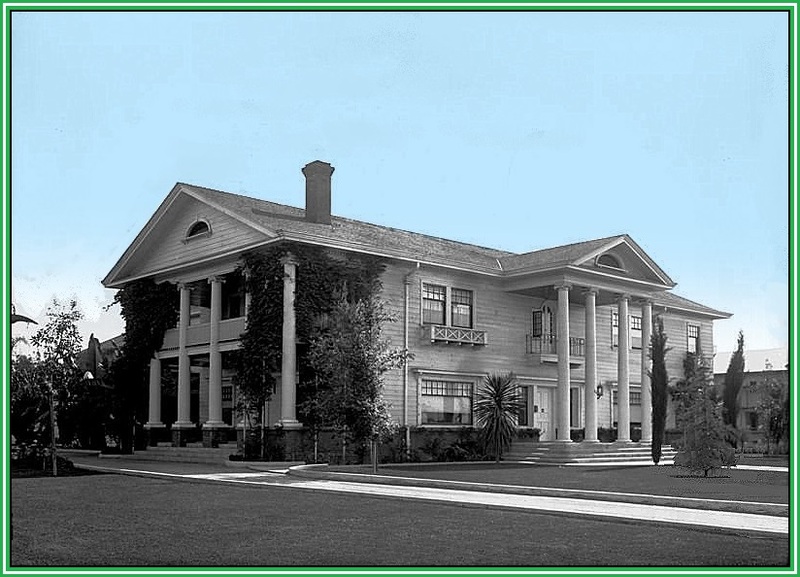 Both were responsible for many distinguished buildings in the Los Angeles area, with Myron cited accurately for several houses in Berkeley Square, including #4, #9, and #14. It seems that newspapers of the day were also often confused. 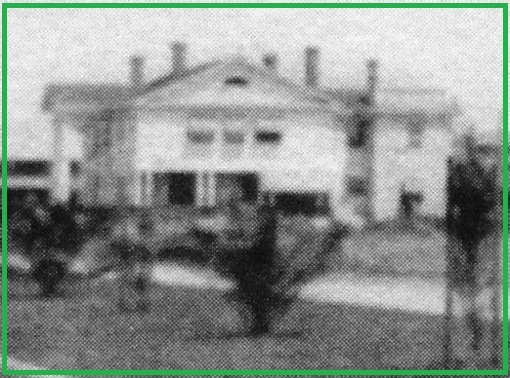 The Times, for example, mentions "Hunt and Grey"—which would be Myron Hunt and Elmer Grey—in connection with the Burke house in an article that appeared on August 11, 1907. Sumner Hunt and Wesley Eager, however, even without seeing their names written on the original unavailable contract, seem almost certainly to be the team to which credit for #6 should be given. Back to the house itself: According to the Herald of January 14, 1906, a building permit for it was issued to Mr. Burke during the previous week authorizing "a 2-story, 15-room frame residence." We know that the five-bedroom, five-bath house was ready by at least the end of the year, since, according to the Los Angeles Herald, Mrs. Burke gave an informal tea in December. Her entertainments at #6 ended just a few short years later, however, when she died on January 25, 1910. Her husband died on July 19 of the next year at the Mayo Clinic following an appendectomy. The Burkes didn't have much time in their new house, but it would nevertheless remain in the family for another fifty years. The Burkes had two children, both living at #6 when their parents died. Carleton was, as his father had been, born in Arkansas, coming west with his parents at age two. He followed his father into the real estate business and became an accomplished horseman himself. He was a Deke at Berkeley and spent 15 months in France during the first World War during which he attained the rank of Major. Later he became quite the man about Southern California, not settling down until rather late, marrying Myrtle Wood Hook in 1932 and moving from #6 to 855 South Serrano Street and later to San Marino. (Myrtle Burke's previous husband, prominent businessman William Spencer Hook Jr., had divorced her to marry Leatrice Joy, who had been married to fellow silent-screen star John Gilbert.) Carleton Burke was the first chairman of the California Horse Racing Board and was involved in many other equine activities, well-known for his polo championships acquired at Midwick games. Among his Hollywood connections were Katharine Hepburn and her galpal Laura Harding. Carleton's sister, Louise, who never married, remained alone at #6 but for servants, nearly until the end of the Square, dying at home on December 7, 1959, at the age of 78. Carleton died in Las Vegas, New Mexico, while enroute to Saratoga Springs by train on July 28, 1962, age 79. The Burkes, appropriately enough, were the family with the longest tenancy in Berkeley Square, which would die with the last of their line as the 24th Street School took over the property occupied by #6 and the Santa Monica Freeway then came through to sweep all remnants of the enclave away. fragment of the shot below, which shows nearer to the camera the Charles O.
far right of the wide picture. Photos: Images of America: West Adams.